Visitors who are heading to the Crystal Coast will find a scattering of hotels and motels throughout the shoreline and inland communities, but will soon discover that the primary type of accommodations available are vacation rentals. 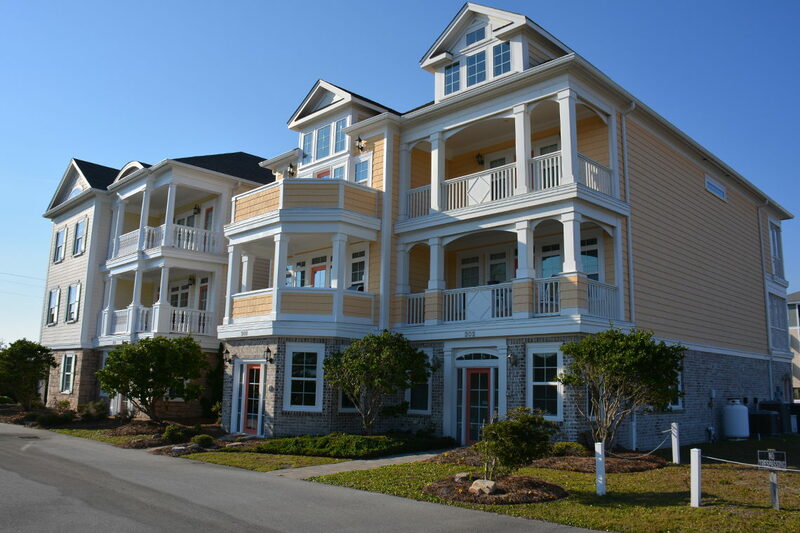 Located all along the Crystal Coast beaches from Atlantic Beach to the town of Emerald Isle, a vacation rental is the generally preferred accommodations option for vacationers thanks to ample space, exceptional locales close to the water, and plenty of homes and condos to choose from. There are a dozen or so resorts, motels or hotels along the beaches of Emerald Isle, but vacation rentals dominate the scene, with more than 1,000 homes, condos, or duplexes throughout the coastal region. The type of vacation rental accommodations vary greatly, and can range from one-bedroom units in popular “resort” style condominium communities to 8-bedroom homes or more that are outfitted with a wealth of amenities. Though it’s possible to find homes and condos that are rented directly by the owner, the majority of vacation rentals are represented by local property management companies, like Bluewater Real Estate, Emerald Isle Realty, and Atlantic Beach realty, just to name a few. This makes the renting of a vacation home easier for both owners and guests, as the property management company handles all bookings, check-in and check-outs, and the cleaning or maintenance of the home. Most vacation rentals are rented on a weekly Saturday-to-Saturday or Sunday-to-Sunday basis, although some properties, (especially condos and smaller units), may be available for nightly or several day increments. To peruse and find a vacation rental in the Crystal Coast area, potential vacationers will want to start online. All area property management companies have detailed websites where it’s easy to conduct a search based on personalized specifications, (like number of bedrooms, location, or amenities), as well as lengthy information on each unit. From there, guests can generally reserve the property with an initial down payment and just a few clicks, and can secure their Crystal Coast vacation without ever leaving their computer. Once the date of a vacation arrives, visitors will typically go straight to the property management company’s office to “Check-in” and pick up their keys, (although some vacation homes are starting to offer keyless entry, where the home will be open as soon as it’s ready for check-in.) From there, visitors can call the property management office throughout their vacation if any problem arises, from trouble with the wireless internet to a maintenance issue. While the size and location of vacation rental rentals certainly vary widely, the type of amenities can vary as well. Because more and more families are bringing their pets along on vacation, many accommodations are “pet friendly” which means that parties can bring their dogs along, generally for a small extra fee. In addition, a number of vacation rentals may be designated as “handicapped accessible” or “handicapped friendly” which means that they are suited for visitors with mobility issues. These properties can have elevators, handicapped accessible bathrooms, ramps, and / or all of the above, and a complete list of features are typically listed, in-depth, in the property’s online description. Additional amenities that are readily available and which grab attention include private pools, game rooms, hot tubs, theatre rooms or media rooms, multiple dens, wireless internet, and access to local community pools or facilities. Traditionally, the larger the house, the more the amenities, which is why the bigger Crystal Coast homes tend to steadily book throughout the summer season. Visitors should note before booking that some amenities are seasonal. Private pools, for example, are typically available from Mid-May until later September, while in-home fireplaces are usually only available during the winter months. Check with your property management company to see what rules apply when it comes to seasonal amenities. One of the best aspects of a Crystal Cost vacation rental is the location, and visitors will note that there are plenty of towns, and areas, to choose from. Every town along the shoreline has a myriad of vacation rental options, which can be located directly along the oceanfront, a few lots back in pretty wooded areas or small neighborhoods, or situated along the Bogue Sound. Visitors who like to be close to all the action – including restaurants, stores, and nightlife – will want to look for properties in the larger towns of Atlantic Beach and Emerald Isle. Vacationers who’d prefer a quieter environment will want to check out the smaller communities in the heart of the island, such as Salter Path and Indian Beach. Both quiet neighborhoods and hopping locales are available, ensuring that guests can find exactly what they want. Visitors should note that while the beach towns are packed with an array of vacation rentals, the slightly inland communities of Beaufort and Morehead City have a smaller selection. Beaufort is home to a mix of hotels, B&Bs and vacation rental accommodations, and the vacation rentals in this town consist of coastal cottages and condos that are connected to local marinas. Meanwhile, Morehead City Is home to mainly hotels and motels, with just a sprinkling of vacation rental options that are typically located in the downtown area. In short, the array of properties along the beaches is nice and varied, but visitors may have to search a bit to find properties that suit their specific needs in the slightly inland regions of the Crystal Coast. Vacation rentals can often be booked up to a full year in advance, so visitors with specific amenities or a location in mind will want to reserve their home as far in advance as possible. Conversely, some vacation rentals may offer last-minute discounts on un-rented properties, or allow partial week rentals roughly two weeks before an arrival date. Check with your preferred property management company for last-minute options. Curious about owning a vacation rental home? A rental can be a solid investment property, and especially for regular Crystal Coast visitors who dream about a long-term home by the sea. Many property management companies also have on-site sales departments for visitors who are curious about investing in area real estate. A Crystal Coast vacation is an ideal time to explore the options, so check in with an on-duty real estate agent to see what properties are available in your preferred area and budget.